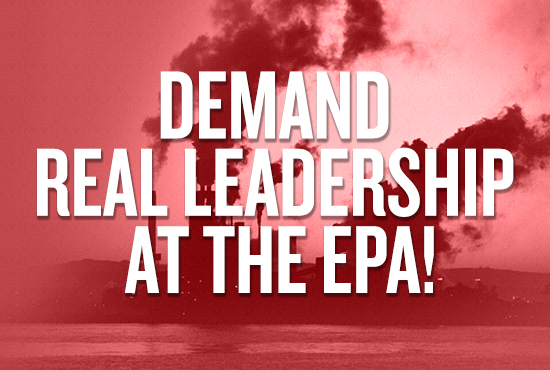 Help Us Restore Trust in the EPA! The future of the EPA is at a critical turning point — former EPA chief Scott Pruitt has resigned, and Administrator Andrew Wheeler is now at the helm. Now is the best chance for us to mobilize a massive public outcry demanding that Wheeler reverse course and protect our clean air and water, combat climate change, defend the fundamental laws that protect our environment and health, and work to restore the effectiveness and public standing of this critical agency. Please add your voice now: Demand that EPA Administrator Andrew Wheeler change course and fulfill the EPA’s mission to protect the American people, not polluters. Demand that Wheeler reverse course and fulfill the EPA’s mission to protect the health and environment of the American people, not polluters.